A vigorous history, by a sympathetic and patient fellow traveler (Letters from Egypt, 1988, etc. 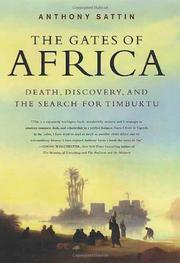 ), of the long-ago efforts by European explorers to reach a fabled African city. It’s still not the easiest thing to reach Timbuktu, out on a bend of the Niger River in the Malian desert. In the 18th and 19th centuries, Europeans wanting to find the city, whose existence was barely a rumor to them, and to open up the Sahara to their trade faced more obstacles still: a lack of reliable maps; an Ottoman Empire to the east that instructed the Muslim faithful that allowing Europeans to pass by “is betraying your Sovereign (the Ottoman Emperor), your religion, and every Mahometan”; actively hostile populations fearing the presence among them of possible slavers and spies; Bedouin and Tuareg bands only too glad to rob and kill, and more, all on top of the inclement natural conditions and lack of amenities. Undeterred, the great botanist Joseph Banks gathered fellow scientists, scholars, and explorers to found a private group called the African Association, which would sponsor expeditions and, at the same time, work to abolish the slave trade. Its founding and first-generation members numbered some astonishingly accomplished men, among them Banks himself, the navigator John Ledyard (“independent America’s first explorer”), the young soldier Daniel Houghton, the gloriously named Scottish traveler Mungo Park. Later generations of African Association members were no less well credentialed, and many of them suffered enormously to accumulate bits and pieces of knowledge about the Niger River and the way to the African desert interior. Sattin’s anecdote-laced tales of their likes, and of the deeds and misadventures of dimly remembered men such as Swiss-born Jean Louis Burckhardt (who sagely remarked, “It is a less fatiguing duty to perform travels than to write them down”) and Gordon Laing (the first European known to have entered Timbuktu), are wholly memorable and, overall, offer fitting tribute to the work of the African Association in all its multifaceted glory. A pleasure for students of exploration, as well as for armchair travelers.